Yes, peaches again! 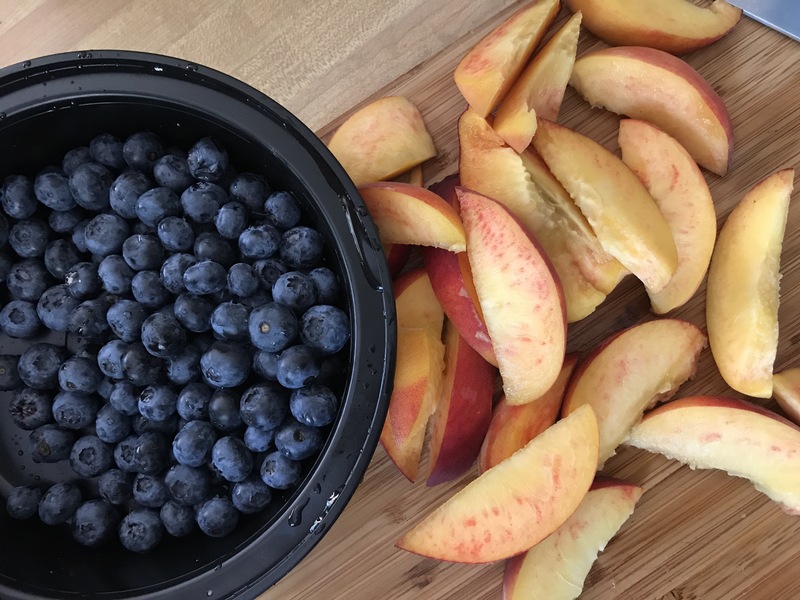 But it is also blueberry season and, to me, peaches and blueberries are a great combination. The both taste and look beautiful together. We were going for our annual 4th of July celebration at Farmer Kim’s and I always bake something for it. 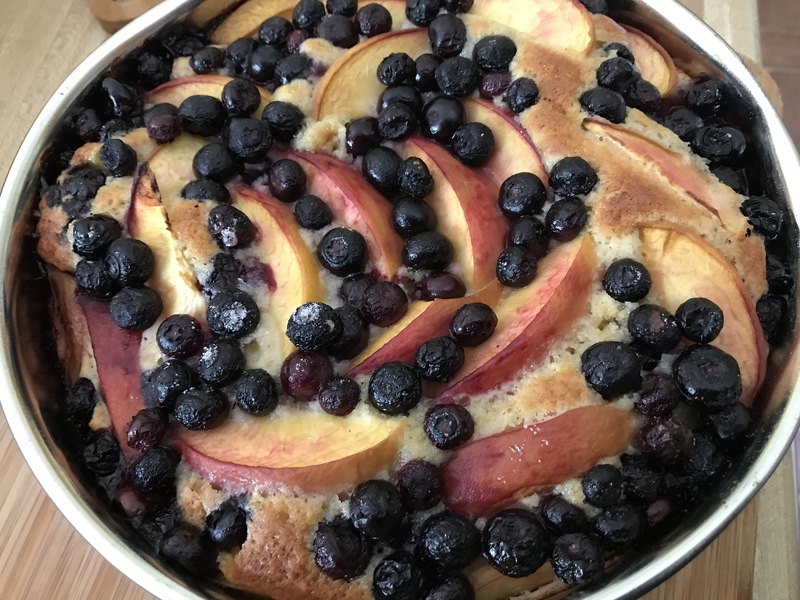 This peach-blueberry cake worked great as a bring-along dessert. It was the perfect level of sweetness, just sweet enough without being too sweet. It was a hit! Preheat oven to 350°F with rack in middle. Grease the side and the bottom of a 9×3 Springform pan with butter or cooking spray. Line the bottom with parchment paper. 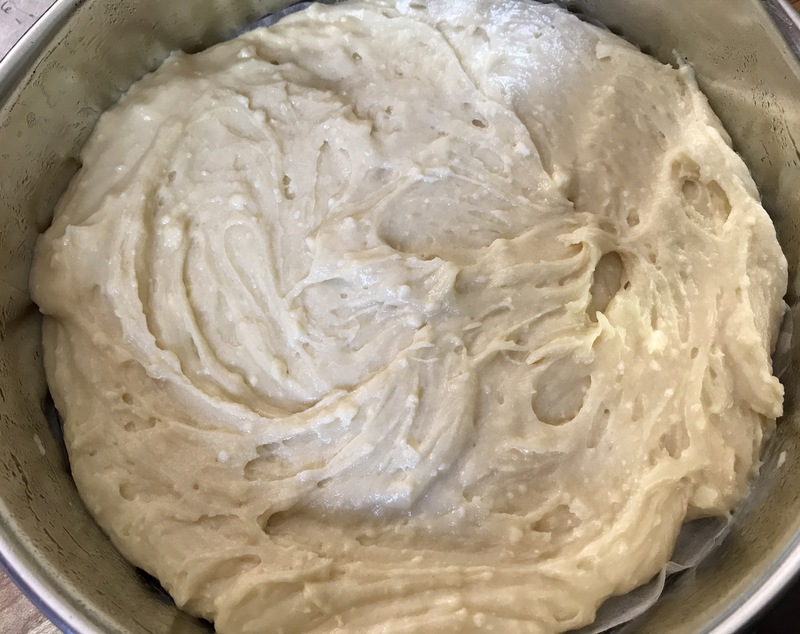 Sift flour, baking powder, baking soda, together into a medium bowl. 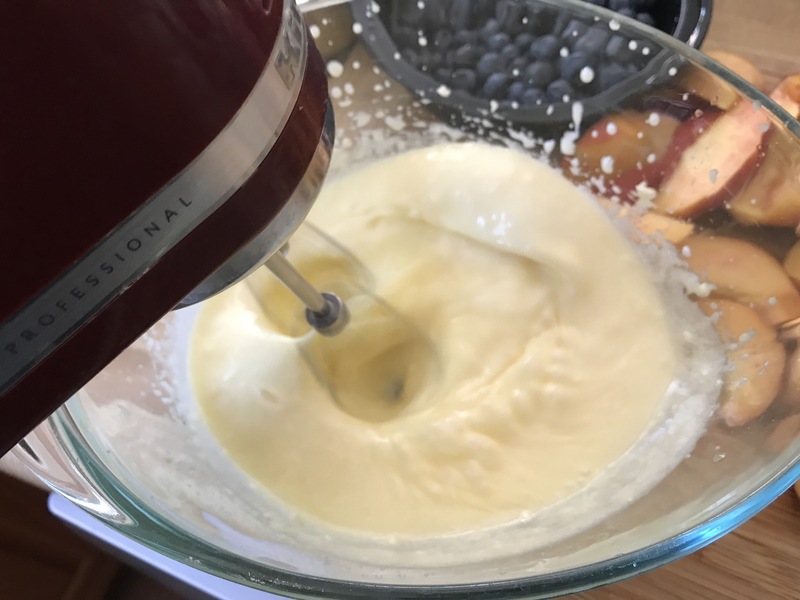 In a separate bowl, beat butter, sugar, and 2 eggs until very light in color and fluffy, 2-3 minutes on high speed. Add vanilla and Greek yogurt and continue beating until very creamy and light in color, for about 1 more minute. 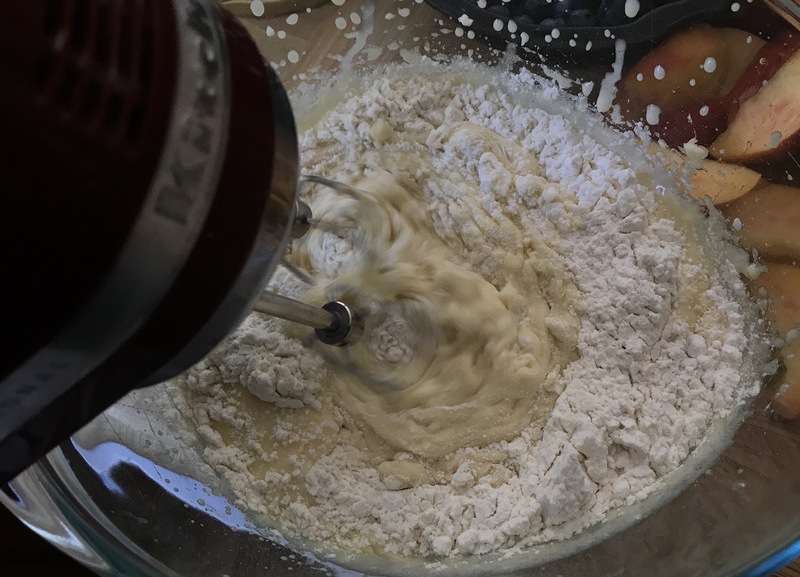 Keeping the mixer speed low, mix in the flour mix until combined. Do not overmix. Transfer the cake batter to the springform pan. 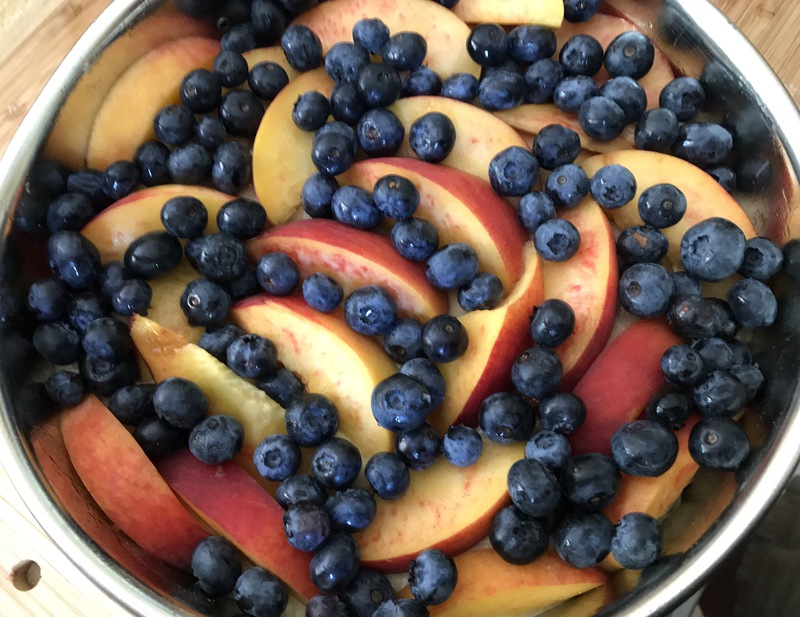 Top with sliced peaches, and scatter blueberries evenly on top in the spaces between the peach slices. Sprinkle the fruit with 1 teaspoon granulated sugar. Bake until cake turns golden, and the tester comes out clean in the center, about 1 hour, depending on your oven. When the cake is done baking, let it cool (still in the baking pan) on a wire rack. After cake has cooled for about 40 minutes, release the cake from the springform pan. 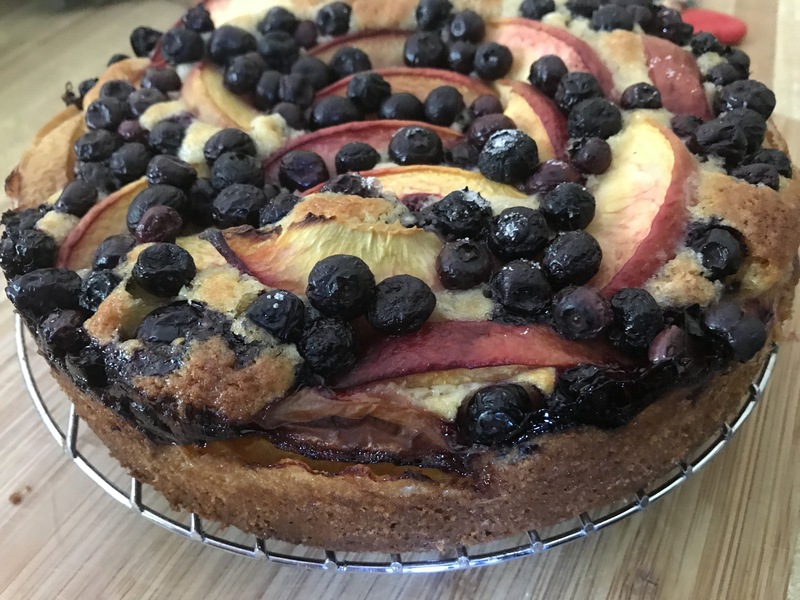 At this point, if the cake is cool enough, you can slide your hand under the cake, between the parchment paper and the bottom portion of the springform pan and move the cake with the parchment paper attached to its bottom onto a cake plate easily. 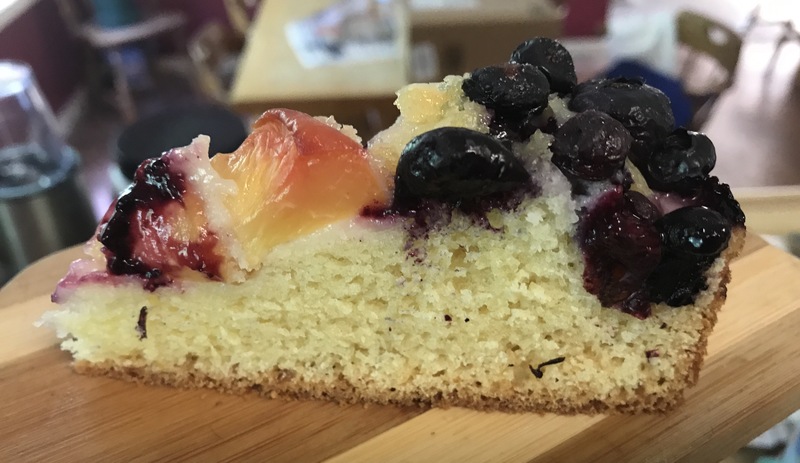 Serves 8 – 12, depending upon the size of the slices.